On July 1 last year, artist Jeremy Deller’s We’re Here Because We’re Here project marked the centenary of the first day of the Battle of the Somme and became one of the most powerful public artworks to have taken place in the UK in recent years. Commissioned by 14-18 NOW, the organisation in charge of the arts programmes around the centenary, WHBWH was conceived by Deller in collaboration with Rufus Norris, Director of the National Theatre. While Deller’s project was national in its scope, it remained sombre and respectful in its tone. Over 1,000 volunteers donned First World War uniforms and gathered silently in public places across the country – each participant representing a real solider who had died on the first day of fighting at the Somme on July 1 1916. If approached by the public, volunteers were instructed to simply offer the person a small white card bearing their name, rank and battalion – and the age they were when they were killed. 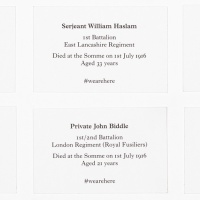 The card also included the tag #wearehere, ensuring that any photographs of the events (soldiers congregated everywhere from mainline stations to shopping centres) could be shared on social media and collected at becausewearehere.co.uk. 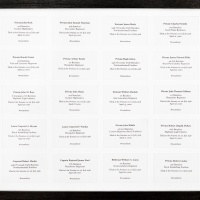 To commemorate the event, Deller has now issued a series of 100 new works, each comprising of a different configuration of twenty of the soldiers’ calling cards that were distributed during the day. All proceeds from the sale of the editions will go to support forthcoming 14-18 NOW programmes and education projects. 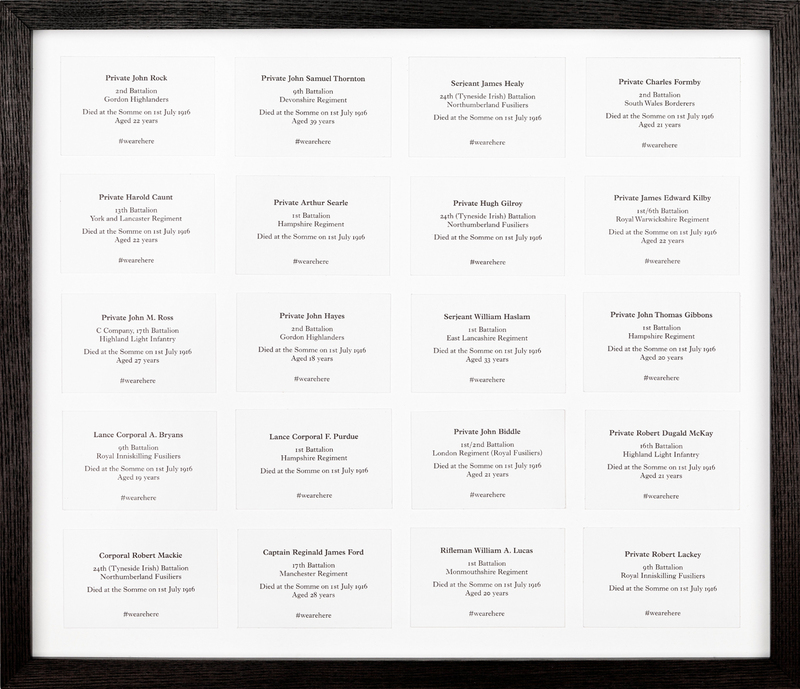 Framed artworks are 37.7cm x 43.5cm; edition of 100 plus 20 artist proofs (£400). Available from iwmshop.org.uk.